Surfing was enjoyed by the Polynesians well before Captain Cook landed in Hawaii in the late 1700s. At the time, he’e nalu, Hawaiian for “wave sliding,” was more than a sport. It was an integral component of Hawaiian culture and boards were made only from revered trees, shaped by craftsmen into that classic surfboard form: long, slightly thinner at the edges, rounded at the front. Today, that artisan tradition continues, although much has changed over the centuries. As modern tools and materials appeared, surfboards morphed from wood to a block of foam with a central wooden stringer for strength, all covered with fiberglass and resin. Modern surfboards are lighter, less expensive and easier to produce, and incorporate curves and angles that make them unrecognizable against vintage boards. 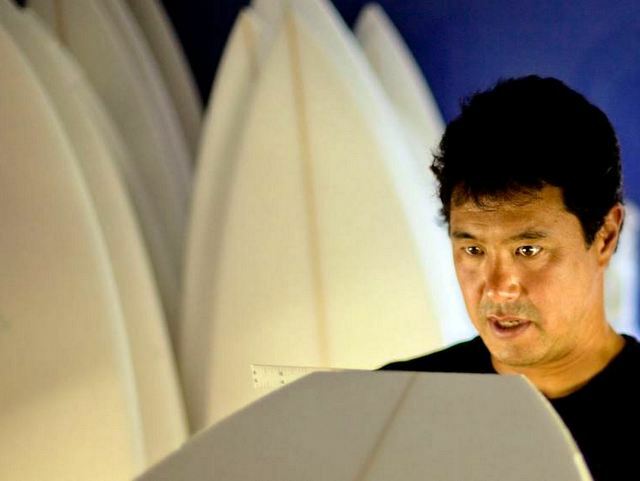 Aku Shaper’s computerized shaping machine dives into a surfboard blank. Even with this radical change in materials and designs, the act of sculpting a rough-cut block of foam, or “blank,” into a final surfboard shape, or “shaping,” has remained an artform. But just as the board has advanced, the art of shaping is being advanced by Aku Shaper, a Hawaii-based company co-founded by Kailua native Jimmy Freese. “I was towards the end of completing a Master’s degree program in chemical engineering at University of Texas and figured I’d head back to Kailua for a spring break rest,” Jimmy recalled when asked how he got started. A few months later, during a vacation in Australia, Jimmy visited a factory with a more advanced, but still crude, machine that could shape a board in 15 minutes. Hand shaping requires about 90 minutes. As a former usability engineer for HotU, one of Hawaii’s dotcom darlings during the early 2000s, Jimmy learned that a software’s user interface was as integral to success as the base capabilities. Knowing that most shapers were more artists than technologists, he knew that usability was critical. Jimmy worked for nearly two years with a pair of Australian partners and his father, a professor at University of Hawaii, to put together a prototype and start selling. Kerry Tokoro of Kaneohe’s Tokoro Surfboards positions a foam blank in the Aku Shaper. As sales started to increase, he returned to Hawaii in 2005 and focused on the company full-time. After a series of disagreements on direction, Jimmy split from his former partner, joined with a new machine designer, Mike Rickard, and Aku Shaper was formed. Jimmy, Mike, and a small team started looking for growth and found it in the standup paddleboarding boom. Standup boards are much larger than a typical surfboard, so the team made bigger machines. Their timing was perfect. As in any craft, there was some initial resistance to automating a previously hands-on process. As word spread, Aku Shaper expanded beyond Hawaii and Australia with customers in Spain, Brazil, Puerto Rico, and beyond. Wade Tokoro inspects a finished surfboard blank at the shop he shares with his brother, Kerry, in Kaneohe, on the island of Oahu. Through it all, the Aku Shaper team and their customers continue to believe that they’ve enhanced the traditions of shaping and surfing. Now there’s the one thing Jimmy never thought he’d help surfers manufacture: an excuse to buy their next board.